the final of the CIFA Knock-out Cup at the CIFA complex in Matavera, tomorrow Saturday 19th December. 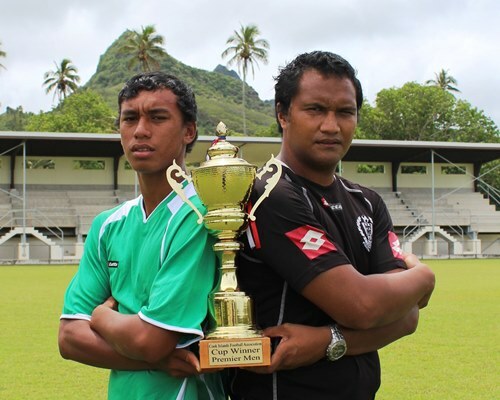 This year they will battle it out for the Brand New Knock Out Trophy that was unveiled to the captains of both teams, Nikao Sokattak Temaeva Mateariki and Tupapa Maerenga’s Mii Joseph this week. With the final training sessions etched away earlier in the week, both sides will battle to carve their name on the new 2015 knock-out cup trophy. There are a number of players in both teams who have been here before or played in the knock-out finals, so the experience helps settle everyone’s nerves and things can be exciting. All in all this premier men’s knock-out final match is predicted to be an exciting one with all the ingredients of attacking and entertaining football to be displayed.